The Bay of Campeche, or Campeche Sound, is a bight in the southern area of the Gulf of Mexico. It is surrounded on three sides by the Mexican states of Campeche, Tabasco and Veracruz. The area of the bay is 6,000 square miles (16,000 km2) and maximum depth of the bay is approximately 180 feet (55 m). It was named by Francisco Hernández de Córdoba and Antón de Alaminos during their expedition in 1517. Mexico's state-owned oil company Pemex (Petróleos Mexicanos) was drilling a 3 km (1.9 mi) deep oil well when the drilling rig Sedco 135 lost drilling mud circulation. Petróleos Mexicanos, which translates to Mexican Petroleum, but is trademarked and better known as Pemex, is the Mexican state-owned petroleum company, created in 1938 by nationalization or expropriation of all private, foreign, and domestic oil companies at that time. Pemex had total assets worth $415.75 billion, and was the world's second-largest non-publicly listed company by total market value, and Latin America's second-largest enterprise by annual revenue as of 2009, surpassed only by Petrobras. The majority of its shares are not listed publicly and are under control of the Mexican government, with the value of its publicly listed shares totaling $202 billion in 2010, representing approximately one quarter of the company's total net worth. An oil well is a boring in the Earth that is designed to bring petroleum oil hydrocarbons to the surface. Usually some natural gas is released along with the oil. A well that is designed to produce only gas may be termed a gas well. Drill pipe, is hollow, thin-walled, steel or aluminium alloy piping that is used on drilling rigs. It is hollow to allow drilling fluid to be pumped down the hole through the bit and back up the annulus. It comes in a variety of sizes, strengths, and wall thicknesses, but is typically 27 to 32 feet in length. Longer lengths, up to 45 feet, exist. At the time of the accident Sedco 135 was drilling at a depth of about 3,600 metres (11,800 ft) below the seafloor. The day before Ixtoc suffered the blowout and resulting fire that caused her to sink, the drill bit hit a region of soft strata. Subsequently, the circulation of drilling mud was lost resulting in a loss of hydrostatic pressure. Rather than returning to the surface, the drilling mud was escaping into fractures that had formed in the rock at the bottom of the hole. Pemex officials decided to remove the bit, run the drill pipe back into the hole and pump materials down this open-ended drill pipe in an effort to seal off the fractures that were causing the loss of circulation. During the removal of the pipe on Sedco 135, the drilling mud suddenly began to flow up towards the surface; by removing the drill-string the well was swabbed (an effect observed when mud must flow down the annulus to replace displaced drill pipe volume below the bit) leading to a kick. Normally, this flow can be stopped by activating shear rams contained in the blowout preventer (BOP). These rams are designed to sever and seal off the well on the ocean floor; however in this case the drill collars had been brought in line with the BOP and the BOP rams were not able to sever the thick steel walls of the drill collars leading to a catastrophic blowout. The oil slick surrounded Rancho Nuevo, in the Mexican state of Tamaulipas, which is one of the few nesting sites for Kemp's Ridley sea turtles. Thousands of baby sea turtles were airlifted to a clean portion of the Gulf of Mexico to help save the rare species. The oil that was lost during the blow-out polluted a considerable part of the offshore region in the Gulf of Mexico as well as much of the coastal zone, which consists primarily of sandy beaches and barrier islands often enclosing extensive shallow lagoons. The oil washed ashore, 30 cm (1 ft.) deep in some places, as it was pushed north by prevailing winds and currents until it crossed the Texas border two months later and eventually coated almost 170 miles (270 km) of US beaches. The beach that caused most international concern in Mexico was Rancho Nuevo, a key nesting ground for critically endangered Kemp's Ridley sea turtles which had already moved inland in their hundreds to lay eggs. By the time the eggs hatched, the oil had reached the shore. An oil spill is the release of a liquid petroleum hydrocarbon into the environment, especially the marine ecosystem, due to human activity, and is a form of pollution. The term is usually given to marine oil spills, where oil is released into the ocean or coastal waters, but spills may also occur on land. Oil spills may be due to releases of crude oil from tankers, offshore platforms, drilling rigs and wells, as well as spills of refined petroleum products and their by-products, heavier fuels used by large ships such as bunker fuel, or the spill of any oily refuse or waste oil. Victoria Machinery Depot Ltd. was a ship builder located in Victoria, British Columbia, Canada. The Santa Barbara oil spill occurred in January and February 1969 in the Santa Barbara Channel, near the city of Santa Barbara in Southern California. It was the largest oil spill in United States waters by that time, and now ranks third after the 2010 Deepwater Horizon and 1989 Exxon Valdez spills. 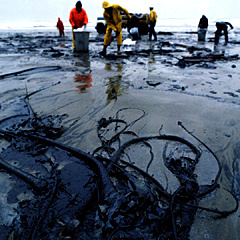 It remains the largest oil spill to have occurred in the waters off California. Q4000 is a multi-purpose oil field construction and intervention vessel ordered in 1999 by Cal Dive International, and was built at the Keppel AmFELS shipyard in Brownsville, Texas for $180 million. She was delivered in 2002 and operates under the flag of the United States. She is operated by Helix Energy Solutions Group. The original Q4000 concept was conceived and is owned by SPD/McClure. The design was later modified by Bennett Offshore, which was selected to develop both the basic and detailed design. Offshore oil and gas in the Gulf of Mexico is a major source of oil and natural gas in the United States. The western and central Gulf of Mexico, which includes offshore Texas, Louisiana, Mississippi, and Alabama, is one of the major petroleum-producing areas of the United States. Oil production from US federal waters in the Gulf of Mexico reached an all-time annual high of 1.65 million barrels per day in 2017. Oil production is expected to continue the upward trend in 2018 and 2019, based on ten new oil fields which are planned to start production in those years. According to the Energy Information Administration, "Gulf of Mexico federal offshore oil production accounts for 17% of total U.S. crude oil production and federal offshore natural gas production in the Gulf accounts for 5% of total U.S. dry production." The Deepwater Horizon oil spill is an industrial disaster that began on April 20, 2010, in the Gulf of Mexico on the BP-operated Macondo Prospect, considered to be the largest marine oil spill in the history of the petroleum industry and estimated to be 8% to 31% larger in volume than the previous largest, the Ixtoc I oil spill, also in the Gulf of Mexico. The U.S. government estimated the total discharge at 4.9 million barrels. After several failed efforts to contain the flow, the well was declared sealed on September 19, 2010. Reports in early 2012 indicated that the well site was still leaking. 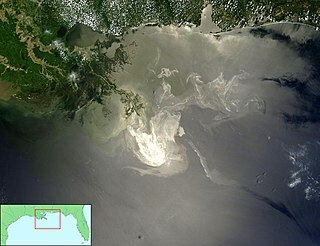 Efforts to stem the Deepwater Horizon oil spill were ongoing from the time that the Deepwater Horizon exploded on 4/20/2010 until the well was sealed by a cap on July 15, 2010. Various species of dolphins and other mammals, birds, and the endangered sea turtles have been killed either directly or indirectly by the oil spill. The Deepwater Horizon spill has surpassed in volume the 1989 Exxon Valdez oil spill as the largest ever to originate in U.S.-controlled waters; it is comparable to the 1979 Ixtoc I oil spill in total volume released. 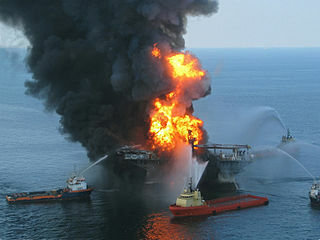 Following is a timeline of the Deepwater Horizon oil spill for August 2010. ↑ Marshall, Jessica (2010-06-01). "Gulf Oil Spill Not the Biggest Ever". Discovery News. Retrieved 2010-06-14. 1 2 John Charles Milne (2 Nov 2008). "Sedco 135 Series". OilCity. Archived from the original on 20 December 2008. Retrieved 20 May 2010. 1 2 Linda Garmon (25 October 1980). "Autopsy of an Oil Spill". Science News. 118 (17). pp. 267–270. ↑ "Ixtoc 1 Oil Spill Economic Impact Study" (PDF). Bureau of Land Management. pp. 4–6. Retrieved 2010-05-06. ↑ Robert Campbell (May 24, 2010). "BP's Gulf battle echoes monster '79 Mexico oil spill". Reuters. Retrieved 30 May 2010. ↑ "BP's Gulf battle echoes monster '79 Mexico oil spill". Reuters. 2010-05-24. Retrieved 2010-05-24. 1 2 3 Jernelöv, Arne; Lindén, Olof (1981). "The Caribbean: Ixtoc I: A Case Study of the World's Largest Oil Spill". Ambio. Allen Press for the Royal Swedish Academy of Sciences. 10 (6): 299–306. JSTOR 4312725. ↑ Glenn Garvin (2010-06-27). "After big 1979 spill, a stunning recovery". The News Observer. Archived from the original on 24 July 2010. Retrieved 14 July 2010. ↑ Teal, John M.; Howarth, Robert W. (January 1984). "Oil spill studies: A review of ecological effects". Environmental Management. 8 (1): 27–43. doi:10.1007/BF01867871 . Retrieved 14 July 2010. ↑ ERCO/Energy Resources Co . Inc. (19 March 1982). "Ixtoc Oil Spill Assessment, Final Report, Executive Summary Prepared for the US Bureau of Land Management, Contract No. AA851-CTO-71" (.PDF). US Department of the Interior, Minerals Management Service Mission: 27. Retrieved 14 July 2010. Photo gallery by the US National Oceanic and Atmospheric Administration.